Down in the sewers, a young Con Ed worker is lost, searching for Grid 19 but having accidentally wandered into Grid 32. The young man is distraught; for fifteen years he’s been plagued with awful dreams and haunted by guilt. He had dropped his pet baby turtles down the sewer by accident many years ago, and ever since, he has had nightmares about them as huge, monstrous things. He even believes that he’s glimpsed them in the sewers on previous work days. The young man suddenly recognizes that Grid 32 is the same sewer tunnel he lost his turtles in all those years ago. Then, by happenstance, he stumbles upon the fragments of the very same glass bowl he dropped down the open manhole. Standing back up, he shines his flashlight forward and comes face to face with the Teenage Mutant Ninja Turtles. Raph sends a shuriken into his flashlight, knocking it to the ground, and lifts the young man up by his collar. Raph and the young man look each other in the eyes and a fleeting moment of recognition passes between them. Don then calls Raph off, telling him to “save it for the Foot”. The Turtles disappear into the darkness. *Taking place fifteen years after they were dropped into the sewer would put this story at around the same time as the first few issues of TMNT (Vol. 1). Personally, I like to place it within TMNT (Vol. 1) #1, between pages 23 and 24, as the Turtles head for their climactic showdown with the Shredder and the Foot Clan. *Chet originally had his name spoken (alternately Chester/Chet) in TMNT (Vol. 1) #7. *The colors for this story depict the Turtles with the multi-colored bandanas of their cartoon counterparts. *CHET ALERT: The name of the young Con Edison worker is “Chet”. The name “Chet” was an Easter Egg thrown into several stories by the Mirage staff because… They just liked the name! The full-color Turtle Soup miniseries was a very good anthology, packed with a bevy of excellent TMNT shorts by both Mirage staffers and guest contributors. But among all the good stuff crammed into those four issues, A.C. Farley’s “Fifteen Years Later” struck a chord with me more than any other. It’s an incredibly short tale, clocking in at only three pages, but its three pages with a lot of weight and significance to them. You may think it silly for someone to feel guilt over their dead pets for fifteen years, though as an owner of many pets, myself, I think it’s perfectly reasonable. The idea of him being so emotionally attached to baby turtles, of all pets, might make it a bit of a stretch, but different strokes for different folks. There’s some inkling of a psychic connection between Chet and the Turtles, as he claims to have had nightmares about his dead pets being human-sized “monsters”, but three pages doesn’t provide much room to explore that angle. 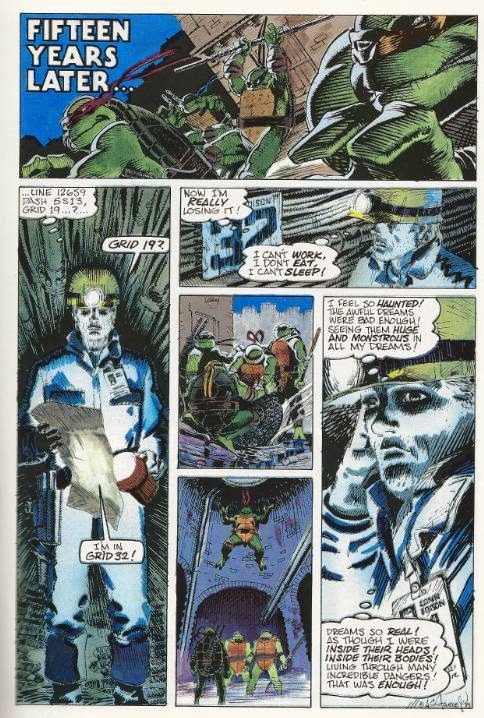 As a sewer tunnel worker, he mentions that he thought he’d seen them in the darkness, so maybe those brief glimpses of the Turtles infiltrated his subconscious and affected his dreams. I dunno. As mentioned in the “Turtle Tips” section, I like to place this story within the pages of TMNT (Vol. 1) #1 (between pages 23 and 24, to be precise). The timeline works out, as TMNT #1 takes place fifteen years after the Turtles fell into the sewer, and Don mentions that they are on their way to battle the Foot, and the only time the Turtles go out looking for the Foot in that window of time is during TMNT #1. The idea of the Turtles running across their old owner while on the way to their climactic showdown with the Shredder helps complete the “full circle” vibe that the story of issue #1 was going for. When battling the Shredder, the Turtles were simply closing the loose end on the tale of Splinter and Hamato Yoshi. But coming across their old owner and inadvertently giving him peace of mind has a way of tying up a loose end of their own. A.C. Farley has always been one of my favorite TMNT artists, right up there with Eric Talbot and Michael Dooney. He knocks this story out of the park, nailing the wistful expressions of the troubled Chet with such precision that you really don’t need his inner monologue to tell you how he’s feeling. Richmond Lewis’s coloring cannot be understated, either, particularly in regards to his manner of lighting with the flashlight. Farley’s art style is already attuned to horror in and of itself, but Lewis really lays the atmosphere on thick. 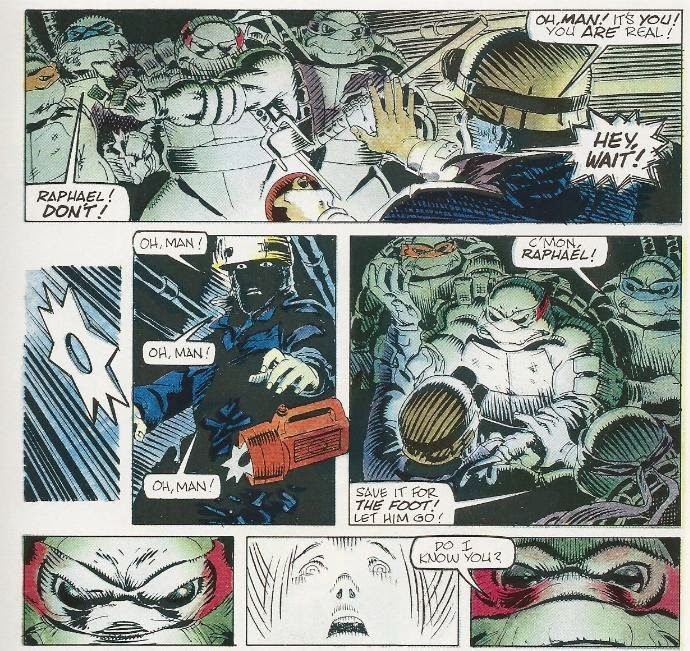 The three panels where Raph looks Chet in the eyes, with the glare from the light on his hardhat washing away his grown-up features, reducing his countenance to that of a familiar little boy, is just tremendous work. There is, of course, the matter of the bandanas. I really don’t know what to tell you. If you wish to strike it from canon because of the multi-colored bandanas that is, of course, your privilege. But I’m more inclined to chalk that up as a mere coloring error so as to keep this wonderful story in the chronology. Overall, the entire Turtle Soup miniseries is worth picking up, even if every story isn’t a winner. “Fifteen Years Later,” however, is a definite winner and my personal pick for best of the entire anthology. It’s short, it’s sweet and it’s perfect.